LONDON, England (CNN) -- The decision of English Premier League giants Manchester United to ban their players from signing autographs at the team's training ground won't affect the sports memorabilia market significantly, an industry expert says. 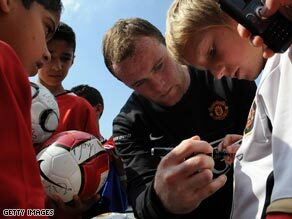 Sorry kids: Manchester United will no longer be giving autographs at their Carrington training ground. The move to ban autographs was announced by Sir Alex Ferguson in the team's match day program for Saturday's 2-1 win over Blackburn Rovers at Old Trafford. Ferguson said in the program he wanted to put a stop to memorabilia dealers using the autographs for financial gain. "I offer apologies to fans who come to the Carrington training ground looking for autographs, he wrote. "The problem is that we have had too many opportunists selling on signed merchandise. They are not fans at all," Ferguson said. While the Independent Manchester United Supporters' Association declined to comment on the issue, a spokesman from a Kent-based supporters' club "Invicta Reds" said he was happy to agree with the manager's decision. "If Fergie (Sir Alex Ferguson) likes it then it's good for us all," the spokesman told CNN. Do you feel autograph-hunters need to be targeted or is this unfair on other fans? Tell us in the Sound Off box below. Football fans, the chance to have YOUR say on CNN is here! The decision comes at a time when the market for replica jerseys and other autographed football memorabilia continues to grow significantly. A quick trawl of the UK's version of auction site eBay shows almost 16,000 autographed football items for sale. These items include signed jerseys, cards, photos, books and prints. Prices vary greatly, however, a David Beckham Manchester United shirt was selling for £300 ($436) on Monday. Vice-president of operations at sportsmemorabilia.com, Mike Gallucci, speaking to CNN, estimated the autographed memorabilia industry was worth about $4 billion a year. "It has definitely been growing, it's big business. In the past, people hadn't realized the price they could get for some of these items. "The power of the Internet has changed this. However, with more players signing more autographs, the market is a little flooded with the items," he said. Gallucci said less accessibility to players for some fans shouldn't alter the market too much as the items sourced from official routes were usually the most popular. "People who want a 100 percent genuine item will buy through a company where they can verify the authenticity," he said. A spokeswoman for eBay said the trading of football memorabilia was very popular on the site and had grown in recent years. More than 90,000 items had been listed in the last three months, and eBay had noticed "a shift in people starting to sell their memorabilia on the site to make money," the spokeswoman told CNN. In the U.S. market, players in sports such as baseball sometimes only signed autographed items on pre-arranged and contracted deals with memorabilia companies, Galluci said. A 2007 Forbes magazine list rating the top ten sports collectibles ranked baseball star Mark McGwire's record 70th home-run ball as the most expensive -- with an estimated value of $3,005,000. All of the top ten items on the list are baseball memorabilia. See the list here.